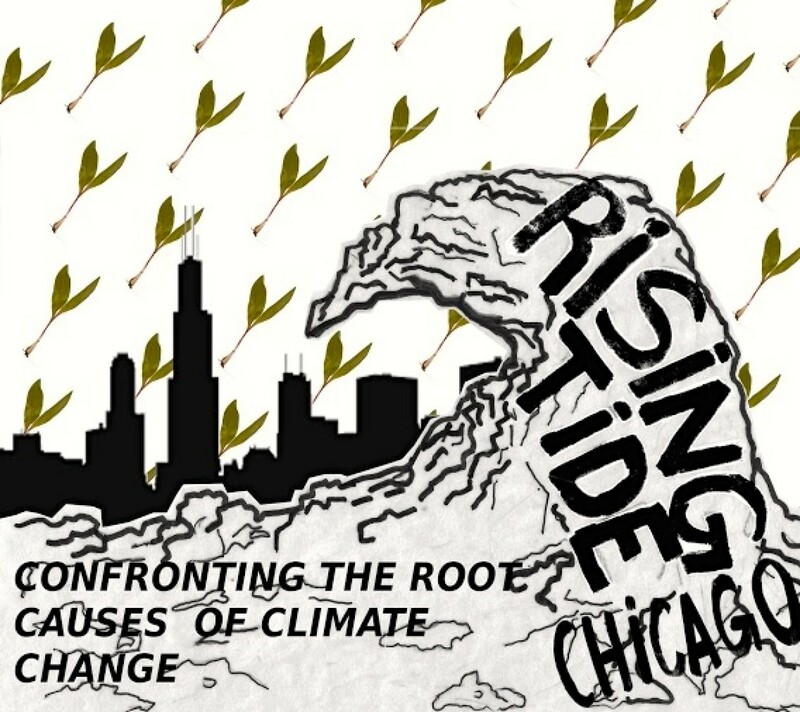 Rising Tide Chicago is affiliated with Rising Tide North America, a network of groups and individuals that use education and direct action to confront the root causes of climate change. We believe that in order to effectively confront climate change, we need to do more than just cut fossil fuel emissions. Our current economic system, capitalism, promotes mass consumption and is at odds with stability and maintaining a habitable planet. On a planet with finite resources, we can no longer allow a “five planet” lifestyle that benefits a small minority of people and results in climate chaos and inequality. A relatively small number of corporations are responsible for the bulk of fossil fuel emissions and our governments continue to allow them to pollute despite grave warnings from Indigenous people, scientists and others. We work in solidarity with others working for justice and seek to demonstrate how our struggles are connected. We fight against patriarchy, white supremacy, colonialism and capitalism which are root causes of the challenges we now face. The people least responsible for the causing the climate crisis are suffering the most. In promoting climate justice, we think it is only right that those that have caused the problem, pay for the solution. Closing the gap on the stark inequities within our communities is a way to help the vast majority adapt to and mitigate climate change. We work to support frontline communities that challenge fossil fuel industries. Educational events, protest, creative activism and direct action are are some of the methods we use to directly challenge the corporations and government entities responsible for the environmental destruction, climate change, mass incarceration and inequality that is threatening our future. We advocate for community autonomy and local, small scale solutions to curb climate change. While each community will have different solutions, some examples include energy-efficiency and conservation, no or low carbon transit, protection and restoration of natural areas, local small scale agriculture and renewable energy. In order to enact these solutions we will need mass movements, community organizing, collaboration, and direct action. We believe that these are the real solutions to the climate crisis that will make our communities safe, secure and sustainable. Facilitated Non-Violent Direct Action trainings for a variety of groups of people. I am contacting you on behalf of two different group that want to be involved with Rising Tide Chicago — The Green Party in Chicago and the Project for a Working People’s World. These are two distinctive organizations that would like to participate in any upcoming meetings/actions and be included on your list serve. Thanks for including us.